MK Binyamin Ben-Eliezer announces he is quitting presidential race, three days ahead of vote and day after corruption investigation. MK Binyamin Ben-Eliezer (Labor) announced on Saturday that he has quit the presidential race, a mere three days ahead of the vote. The announcement comes in the wake of a police investigation launched Friday against him on corruption allegations. "Since I announced my candidacy, there has been an aggressive and orchestrated smear campaign against me, with the sole purpose of preventing me from being president," Ben-Eliezer said in a statement. "With a very heavy heart, I've decided to withdraw from the race," added the 78-year-old Ben-Eliezer, who was a general in the IDF and later held several cabinet posts in the Knesset. 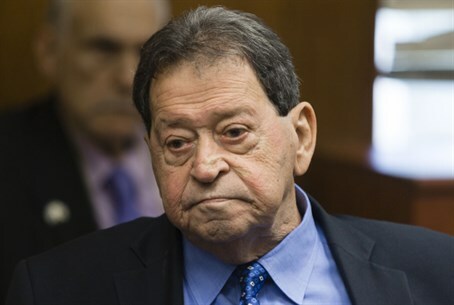 Ben-Eliezer was questioned for five hours on Friday on suspicion of receiving large sums of money illegally from several sources, including from wealthy businessman Avraham Nanikashvili, who was recently questioned in connection with another case related to corruption at the Ashdod Port. Following the investigation, political officials indicated that his hopes of achieving the presidency were essentially ended. Ben-Eliezer's Labor party is reportedly meeting to discuss its course of action moving forward, in light of the new announcement. In his statement announcing the end of his presidential bid, Ben-Eliezer denied the charges and vowed to clear himself of the accusations against him. He said the decision to quit the race was meant to prevent delays in the election process. "I hope the 'targeted killing' I was subject to will be the last affair in this presidential campaign," Ben-Eliezer said. Another presidential hopeful who removed his bid after investigations is Energy and Water Minister Silvan Shalom, who exited the race in late May after learning Prime Minister Binyamin Netanyahu would not throw his support behind him. Investigations were opened in March and later closed against Shalom over alleged sexual harassment of a female employee 15 years ago, in what many analysts believed to be an attempt by political rivals to quash Shalom's freshly announced presidential bid. The election on Tuesday will name President Shimon Peres's successor to the largely ceremonial position of president, a position responsible for signing international agreements and other official documents but not for making any executive decisions. Five candidates remain in the running, including MKs Reuven Rivlin (Labor) and Meir Sheetrit (Hatnua), former Knesset Speaker Dalia Itzik, Nobel Laureate Professor Dan Shechtman, and former Supreme Court Justice Dalia Dorner.